Russian Souvenirs | Visit Russia in Arizona! Matreshka (nick name from a Russian lady name Matrena(matryona, some suggest that it is a translation from Latin Mother) – nesting wooden doll, a Russian folk wooden toy that looks like a painted doll and has similar dolls of smaller sizes inside. The number of the dolls inside can be from three and up. Matreshka has an oval shape with a flat bottom and consist of two parts, upper and lower. Traditionally, it is painted as a woman in red sarafan (traditional Russian dress) with a yellow scarf. There are a few different styles of painting matreshka: Semenovskaya, Kirovskaya, Tverskaya, Vyatskaya, Sergievo-Possadskaya. The topic for Matreshka doll painting can vary from fairy tale characters to political figures. The folk doll toy Matreshka became a Russian souvenir that is famous worldwide. It is believed that a Russian wood turner, V. P. Zvezdochkin had invented the shape of the Matreshka in 1890’s. And the author of the original painting was a Russian professional artist S. V. Malyutin. There is an opinion that Russian Matreshka has Japanese roots. According to the reminiscences of Zvezdochkin, he never saw the Japanese wooden toy. 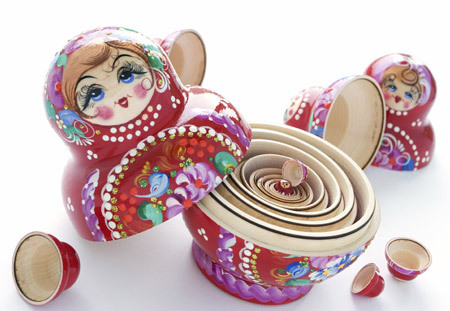 Before the origin of Matreshka, Russian masters were making wooden Easter eggs that were hollow inside and could be opened just like Matreshka. The verisimilar origin of Matreshka is that the Russian master had created Slavic characters on the topics of the folk stories. Some authors believe that Russian craftsmen have been making nesting dolls since the mid-1700s. In 1900, M.A. Mamontova, presented Matreshka at the World Exhibition in Paris, where it earned a bronze medal. And so began the newest Russian handicraft. Soon, many other places in Russia started making Matreshkas of various styles, designs and themes. Since then, this lovely and entertaining art form has continued to win awards world wide and the hearts of many people. 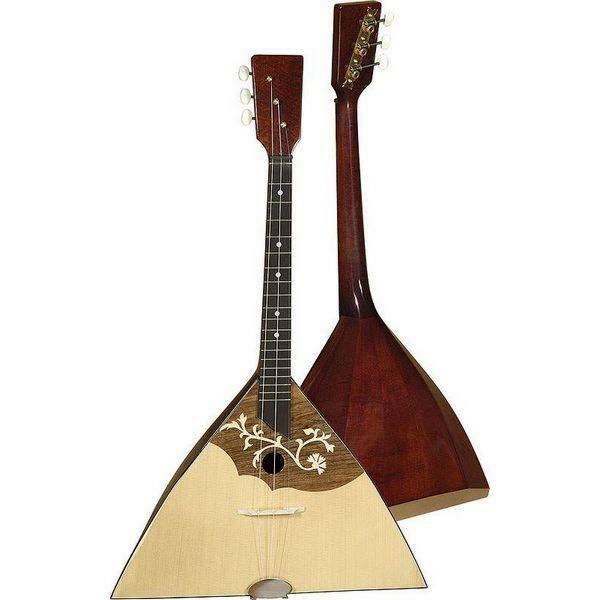 Balalaika (Balalayka)Russian folk music instrument. It is a stringed musical instrument of Russian origin, with a characteristic triangular body and three or more strings. 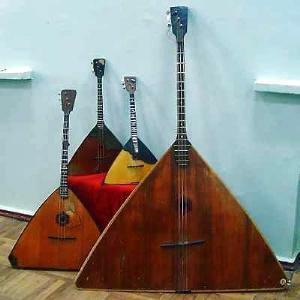 The Balalaika family of instruments includes, from the highest-pitched to the lowest, the prima, sekunda, alto, bass and contrabass Balalaika. All Balalaikas have three-sided bodies, spruce or fir tops and backs made of from three to nine wooden sections, and all usually three strings. The Balalaika is the soul of Russian folk music with its typical Russian sound and quick varying moods, played in traditional Russian folk rhythm, in classical or modern styles. The history of origin of Balalaika rooted in early ages. There are a few opinions on the origin of the Russian Balalaika. Most people believe that it was originated in 1715; but there are some records of Balalaika that are as early as 1688. It could be created by serf peasants to adorn their hard life. Later Balalaika spread among peasants and skomorokhs. Skomorokhs were performing at the fairs, cheering up people and making their living this way. Later playing Balalaika was prohibited by the Grand Duke of the Ancient Russia, Aleksey Mikhailovich. He ordered to gather all musical instruments and burn them. And people that played or kept the instruments could be birched or exiled. After the tsar’s death, Balalaika’s sound would begin to sound all over the country again, but not for a long time. Balalaika’s popularity decreased through the middle of the XIX century. Balalaika was lost for a while. Only some peasants were still playing it. Ones, travelling around his estate, a young nobleman, Vasiliy Vasilievich Andreev, heard his house-serf Antip playing Balalaika. He was amazed by the special sound of this instrument. Andreev was an expert on the Russian folk instruments. He wanted Balalaika to become the most popular instrument. He learned to play Balalaika himself. Andreev noticed that Balalika had a huge potential; and he wanted to improve Balalaika. Andreev went to Peterburg to visit a violin craftsman, Ivanov, and ask him to improve the sound of Balalaika. Ivanov refused to work with Balalaika. After giving it a thought for a moment, Andreev pulled out an old balalaika that he had bought at a fair for thirty kopeek (equivalent of 30 American cents) and masterly performed one of the many Russian folk songs. Ivanov could not resist and agreed to work on Balalaika. After a long and hard work a new Balalaika was made. But Andreev had been thinking about something that was beyond creating an improved Balalaika. He wanted to return Balalaika back to peasants and spread it widely. Now all soldier serving the army would receive Balalaika. When living the army, solders were taking Balalaikas with them. Thus, Russian Balalaika would spread around the country once again, and became the most popular instrument. Andreev also had in mind creating a family of Balalaikas of different sizes according to a string quartet. He invited craftsmen Paserbskiy and Nalimov to work on Balalaikas. Working together, they created piccolo, descant, prima, secunda, alto, bass, and contrabass Balalaikas. With these Balalaikas a foundation of the Great Russian Orchestra was created. The orchestra had visited many countries of the world popularizing the Balalika and the Russian culture.